Which ones are the PCs? The cool ones the story is all about! One of the fun parts of running a campaign is experimenting. Part of my exploration into creating a player-driven campaign rests on incorporating PC Backstories. By integrating their backstories, the campaign becomes their story and not just mine. I want to get to the DM side, but as I started writing this and pulling up all the cool links my gaming group has shared over just the past year… I had to write first about PC backstory. Backstory is anything that helps explain why your character is what he/she is today. It can be where you were born and raised, what social class you came from, events that helped shape your PC, etc. Assuming you like being more than just mechanics on paper (and if that’s how you roll, no problem! ), you to some extent create a personality for your PC. Almost everyone does this. Maybe your PC is mean and moody. Maybe she is heroic and confident. Maybe he is scared of spiders. These kinds of RP characteristics help you think about how you relate with the environment around you. Explaining how you got to have these defining characteristics can help you have a really superior experience. It may seem silly to some at first, but as you think about your PC’s past you start establishing layers for the persona. Personality: Althalia is a forceful warlord. She expects a lot of those she commands. She barks commands and expects them to follow. She leads from the front, never afraid. She acts like a mercenary, accepting any job that will give her strength. Backstory: Born to wealthy Balican noble parents, Althalia enjoyed an easy childhood. She knew she would lead people, from slaves to household staff, to merchants and even templars. Her tutors told her she would even lead the house soldiers one day and trained her accordingly. It would be an easy life. That all changed one evening while she slept over at a friend’s house. A rival noble house struck in the night, destroying everyone and everything except for her. Her family name worthless, her “friend” gave her just enough time to escape Balic. Althalia turned bitter that day. She would lead men, surely, for she did it well. And yet, she would do it with little pleasure until she could find vengeance. She bides her time and builds skill and allies until the day when she can return to Balic and strike down the responsible nobles. When we work on the backstory we learn new things about the PC. As we play, we can now see things differently. If we encounter a slave tribe, she may now want to lead it or to establish an alliance with them. If she meets nobles, she may be suspicious and conceal her name. She will avoid going to Balic, but not share why. Immense depth is added to our PC. In addition, the backstory can be shared with the DM. We will talk about how the DM can use the backstory next time. There are several ways to go about fleshing out your backstory. Depending on how experienced you are with this, you may just do it by thinking it out. Most of us will also use one of a few methods to help with the process. I will include links throughout, but it is probably best to read through this post and then go back and visit the links that interested you when you have time. Writing an In-Character narrative can really help flesh out a PC. I will often come up with the personality and backstory at a really rough and preliminary level, then write a piece of fiction. I find the story brings focus to what my PC really would and would not do and helps round out the personality. I also end up really knowing my background because I end up visualizing the story. I can recall how my cursed bard rolled an old lady in a ditch pretty vividly (she cursed him to never taste ale unless he performed good deeds, forcing him to become a hero)… as if it had happened in a game session. In the long term, I find this to be one of the best techniques, especially with experienced gamers. Sharing these fictions before the campaign actually starts can be a really strong way to establish the PCs so everyone feels they know one another. I find this to be one of the most simple techniques and one of the most effective, especially for new players. The concept is to roll up your PC and then look through a list of questions that guide you towards the type of personality and backstory your PC has. Simple questions like “To what social class did you belong?” and “What motivates you” can really help develop a PC. Games like Shadowrun and Legend of the Five Rings provide series of questions within the books. The old AD&D character sheet used to have a line for fears and desires, which gets to the same idea. If you met an arcane caster, what would you do? With what city-state do you ally with, and why? How did you come to choose the weapon you wield? How do you react to templars? 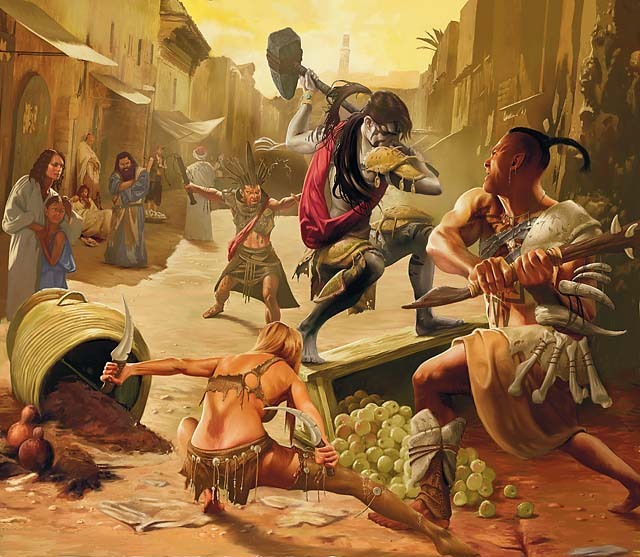 Those kinds of questions can help a DM have a feeling for how encounters might play out and whether the PCs will be receptive towards some of the campaign underpinnings. Gnome Stew talks about experiences with Amber (a dice-less RPG) and an Anatomy of 20 Questions. Specifically, the author is talking to the DM and how they can provide questions that help make the campaign more interesting for the players. Wimwick at Dungeon’s Master provides 27 questions and some additional ideas and links. A successful leader leads from the front. They must never show fear. Every step taken must improve the chances that she can gain revenge against the noble house that killed her parents. Athas has forgotten knowledge, but this is best left forgotten for it is dangerous and leads us astray from the reality of the present. One of the nice things about Beliefs is that they serve as top-level guides on how your PC will react to some situations. They guide what you do. A rule of thumb is that you can change a belief over time, but that becomes a big deal (in a fun RP way) and must be replaced with the new related belief (perhaps forgotten knowledge holds the key to defeating that noble house!). Instincts are things your PC will do nearly automatically, but not to the point of danger. Your PC just seems to do these things. In Burning Wheel a PC that says their sword is always drawn when combat starts would get that benefit. In 4E, you may or may not give a tangible benefit. In Burning Wheel you gain benefits for doing things that are driven by your beliefs and instincts. Adding this to a campaign can be a lot of fun. For example, when she pulls out some dried fruit to give it to the menacing creature, she may gain a bonus to her nature roll to pacify it. When that trap on the ceiling goes off, she might get a bonus to her defense. I have used Beliefs and Instincts in a game and I find it a really nice method, especially with players that are good at RP. Gnome Stew talks about Three Motivators, a very similar concept based on Eclipse Phase (awesome game! ), in turn influenced by Burning Wheel. It can be surprisingly effective to roll up a PC backstory. 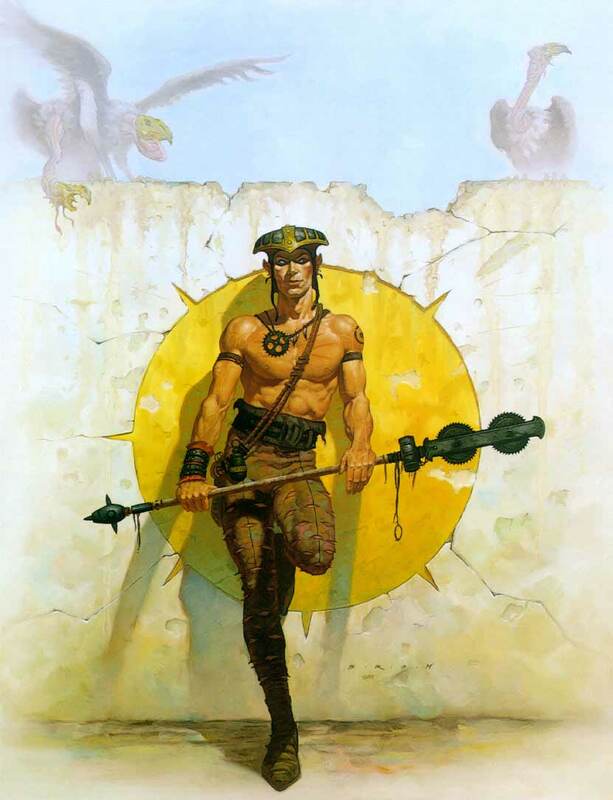 One of the coolest books out there, Central Casting Heroes of Legend, is long out of print and demands a pretty hefty sum (more than I believe it to be worth). The concept (perhaps coming from the game Cyberpunk) is to roll on various tables to determine your backstory. The random roll results lead you to specific tables. You might roll that you are poor early on, and then go to a table to determine how you became poor, finding you were once wealthy. Then you roll to see why you lost it, and you find you had a powerful enemy that took the wealth from your family. Central Casting is pretty thorough. A lot of it might not fit your concept, but it almost always produces a few worthwhile ideas. Sometimes it can be a really cool way to come up with a framework you can flesh out later. Along those lines are this wiki on Lifepaths, with some tables for D&D. It is simpler but still captures the idea. Background Noise has some good reviews as a book clearly emulating Central Casting. One of the cool techniques we also use is to link backstories. As players design their backstory, they choose one other PC and weave them into their story. No player can chose someone that chose them, creating more of a web. PC A might say that they see PC B as having saved them from hungry Gith, and now he seeks to repay the debt. PC B might acknowledge that and add a bit of depth, but then chooses PC C and says that their PC has approached C to ask for help with an ancient map from PC B’s family. PC C adds a bit to that, and creates a backstory with… This goes on until everyone has one link with a PC. The beauty of this system is that everyone shows up with reasons to be together and with a shared understanding of at least two other PCs. Some of this may be shared on a group forum and some may be just between the specific PCs. Regardless, a good rule of thumb is that the DM should be copied on everything so that the DM can use this in the campaign. One approach that takes discipline but can work well is to develop in stages. For example, detail the last 10 years or the very young formative years, but not the rest. As you play in the campaign, fill in the blanks. I find this unsatisfying because I like to really flesh out a PC, but it can work well as a way for a player to create backstory quickly and work on more later. It can also be a challenge to see how the story changes over time. Perhaps the formative years were ones of poverty for the merchant PC, but over time you add that the years that followed were ones of unexpected wealth, which was then lost again. Gnome Stew has a short piece on Player Charaters: Emerging Complexity. The idea is to detail what happened in the last few days and draw a lot about how your PC’s personality based on that. The real past can come out later (see above) and you still give the DM some ideas on the type of PC you have (but not a lot that they can use in the campaign, unfortunately). Still, I like this as sort of a checklist to keep me forgetting the importance of what my PC did just before starting the campaign. “Ok, your parents were killed in Balic 20 years ago… what have you been doing this year?” It is surprisingly easy to not have an answer to that question. The Weem has a short but sweet thought on designing Character Foregrounds. Having a cool backstory really helps a player have fun in a campaign. Having a party full of cool backstories, especially connected ones, is a recipe for a lot of fun RP – before you even roll the first dice! This entry was posted on October 7, 2015 by Alphastream and tagged Backstory, Character Building.